Chemoreception in fish, i.e. gustation and olfaction or more simply taste and smell, can play a large role in fishing success. While all fish can likely taste to some degree, taste would not be considered to be a primary means of identifying food for most fish. The one great exception to this is the catfish and bullhead families. Catfish and bullheads are equipped with taste-buds across the surface of their body, inside their mouth, pharynx, barbells and gill arches and taste is their primary means of finding food. For most other species taste can still play an important role in angling success. While taste may not be a means to find food, when a fish takes a bait (lure) into its mouth the taste of the offering can affect how long it is willing to hold onto it. 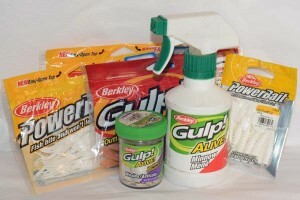 The proliferation of scent and taste infused soft plastics are a big testament to the effectiveness of this concept. The addition of smell and taste to your lure offerings can make the difference between catching and not, especially for finicky fish. In fishes, scents are detected in the nasal sac via water drawn in through an opening in the head called the nare. Smell is extremely important in fish for several life functions including feeding, reproduction, kin recognition, escape from danger and migration . Scents can be detected with extreme sensitivity and for some species and chemical compounds (e.g. Atlantic Salmon and testosterone) concentrations at as little as the parts per trillion range  can be detected (equal to a litre of liquid in one km cubed, or about a teaspoon of liquid (5 ml) in a lake 13 feet deep, a half mile wide and a mile long). Smell is extremely important in fish for several life functions including feeding, reproduction, kin recognition, escape from danger and migration. Water current direction will play a large role in what a fish will be able to smell, particularly when looking for a food source. A fish upstream of your bait will not smell it but fish downstream can, suggesting the need for your bait to be ahead of the fish in current for scent to play a role. Fish may also be tuned in to specific smells, their preferred prey for instance. In essence, it may be necessary to “match the hatch” for smell as well. Many of the available commercial scents use this knowledge of specific species to improve catch success. What smells like it might work to our senses may be of no importance to a fish’s palette. Fishing scented baits requires a bit of patience as one must wait for a “scent cloud” to build up in the area being fished for them to be effective (much like the effects of “chumming”). Scented baits are also generally designed to release a burst of scent and flavor when bit, enticing the fish to hold the bait in its mouth for a longer period of time. H. Hino, N.G. Miles, H. Bandoh, H. Ueda, Journal of Fish Biology, 7 (2009) 945-959. A. Moore, A.P. Scott, Proceeding of the Royal Society B, 249 (1992) 205-209.